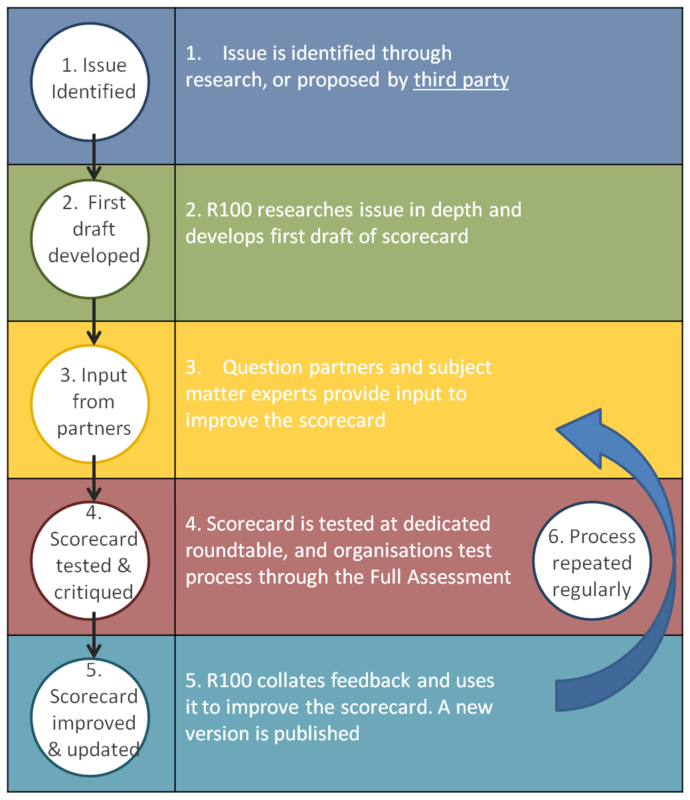 R100 scorecards aim to give a comprehensive account of what POOR, OKAY, GOOD and EXCELLENT performance looks like on any given social, environmental or governance issue. They seek to categorise all the policies and practices described by businesses and organisations in the information they submit, as well as those observed in the wider world. Identification: Developments in the field lead R100 to work on new topics. A responsibility issue is identified through continued research, or when they’re proposed by a third party. Care is taken to avoid overlap across different scorecards, although common themes do frequently emerge across separate issues. Research: R100 researches the issue in depth and develops a first draft of the scorecard. Partnership: The question is discussed with experts in the field - either academics, business leaders and practitioners or NGOs. These experts provide input to refine the scorecard. Testing: The scorecard is intensively tested at a dedicated roundtable and through its use in the Instant and Full Assessments. Users are encouraged to provide feedback and experts are asked to identify any additional aspects. Feedback: R100 collates feedback from the roundtable, its assessment tools, and from community members. This feedback is then used to improve the scorecard. A new version is published. Steps 3-5 are iterated. Scorecards are therefore subject to ongoing development and improvement.